Great location. Great sized rooms and facilities. The hotel was great for a family due to size of rooms with separate living space. Inclusion of breakfast and cocktail reception - and very central location, made it a wonderful spot for our holiday. The suite was perfect as it was more spacious than an average hotel room with a seperate bedroom. We had an ocean view suite with a balcony on the top floor with a great view. Location was perfect, only one block back from the beach, minutes walk to the beach, shops, restaurants and an ABC shop across the road. Local trolley bus also only minutes away. Great breakfast included and also evening drinks and canapes which was great. shared guest laundry which comes in very handy. We booked this hotel based on location and it was just right. The included breakfast is good and the happy hour every afternoon was fun. From the moment we arrived we were in awe. The check in process was good and a cool refreshing drink was given to everyone. We had a one bedroom room which had ample space. Beds and pillows were comfortable. The managers reception every night 5.30-7.30pm was beautiful around the pool area. Free drinks, cocktails and nibbles. The made to order omelette for breakfast was yummy. The staff were all so helpful and friendly. The location is a 2 minute walk to the beach. I would definitely stay here again on my next visit. We stayed in 3 hotels on our visit and this one was the best. Modern and clean. Separate bedroom and lounge area, daily free breakfast and free nightly cocktails. Located in the next part of Waikiki and only three minutes walk from beach. Good for families. We had a great stay at the Embassy Suites. However, upon arriving we were very disappointed the pool had just started renovations and not in use for our entire stay. We were unaware of this when we booked. With two kids the pool plays a big part in choosing hotels. 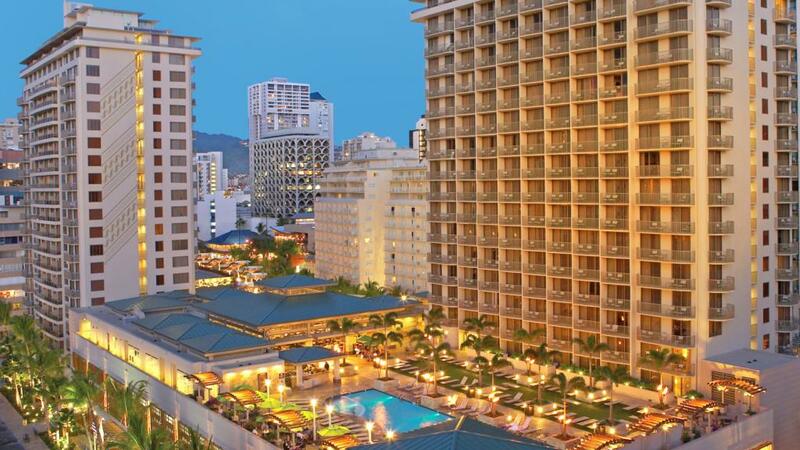 However we were happy to be able to use the Outrigger pool which was a short walk across the street. Breakfast and nightly drinks is fantastic. Good location to the beach, restaurants, shopping and more. Would stay there again. Great place highly recommend ! Wow fantastic place, would highly recommend, great staff everyone is very friendly, great pool, nice rooms, 2 hours free cocktail and entertainment each night- certainly cant beat that !!! central to everything, will definitely go back ! Cheerful staff and excellent customer relations. Great pool area particularly for families with small children. Great position convenient to central Waikiki and transport. Location fantastic, evening cocktails lovely, breakfast buffet - make your own omelette was great. Our room initially was 2nd floor right next to lift. Was fairly loud !! We had just come from Maui and stayed right near a lift at that hotel. I'm a light sleeper and thought I can't do this again, especially when we are paying a fair bit of money. I politely mentioned to porter he called down to front desk and immediately another room was organised. It was in the Hula Tower, 7th flr, facing beach and pool.... it was gorgeous. 100% improvement. All hotel staff courteous. Our lady from housekeeping was so friendly, greeting us every morining. We had a wonderful stay. Loved the included breakfast and afternoon drinks.